Former NZILA president Shannon Bray has been fossicking through old NZILA newsletters, from the very first issue in 1974, through to 1976. He thought you might find some of the articles interesting. Here’s one from Issue 2, June 1974. Man and biosphere. Physical, biological, and cultural values all interact to give us an “architectural” landscape. To some just words; to others a fullness of understanding. In six years plus of landscape architectural endeavour we have come far in understanding how the preceding terms have their effect on New Zealand and New Zealand’s way of life. We still, however, have a long way to go in developing that understanding of the “cultural” landscape many of us feel it deserves. It is often criticised that New Zealand landscape architecture lacks a “design” understanding although we are strong on “environmental interpretation”. Much to the detriment of the former design values we must accept that such criticism for few of us would deny it; but what is design? Is it that international, almost recipe “thing” which pervades so much of architecture, industrial design and “hard landscaped” areas? Do we as New Zealanders want this international “thing”, so that as a country we are no longer recognisable? Or do we aspire to a new and better cultural value of landscape architecture and design which expresses “our” country and “our” cultural values? NZILA’s 1974 Executive Committee. 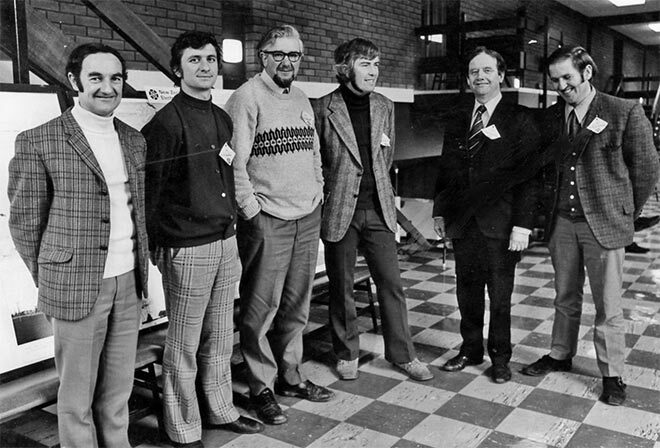 Chairman Tony Jackman who wrote this editorial, is third from the right. I fundamentally believe it is the latter that we should all hope ahead for; and what better way to establish a foundation for our own development than on a strong understanding of biological and physical values. We should not make the same mistake as others of our creed; after all, landscape architecture as a profession in both the UK and USA has long been established in the “design” understanding, yet in both countries there is ample evidence of “environmental mess!”. We should look therefore with confidence at ourselves, look to ourselves, and at the same time look and learn from others – for looking with understanding can only bring profit to an “all-rounded-looking” profession.